Paul McAuley is a vastly under-appreciated author. His books are inspiring, hypnotic and inventive. Austral is all of these and more, a book set in a plausible, climate-changed future where the planet has a new continent with a partial thawing of the Antarctic. There are still vast vistas of ice but there's also large expanses of grass and trees and other flora. The planet isn't the only thing that's changed, people have too - or at least some. Experiments in genetic engineering have produced an altered people, a minority nicknamed huskies. Austral Morales Ferrado is a husky, born from "Ecopoet" parents. Along with other Ecopoets, her parents moved to the newly uncovered land in order to create a new ecosystem. At some time these visionary biological engineers fell out of grace and were criminalised, much of their work (such as the engineering that created the Huskies) banned. Austral works as a "correction officer" for a dangerous prison / workforce on this newly revealed landmass. Her altered physique means she is much better suited at surviving the harsh climate. Seen as an outcast amongst those unmodified, Austral is a survivor and does what she has to. This includes becoming a fugitive after kidnapping Kamilah, the teenage daughter of powerful Deputy Alberto Toomy, in order to escape a bad situation. The story follows the developing situation, with Kamilah becoming an important target for those wanting to hold ransom against Toomy. The future predicted in Austral isn't the most positive. It's not apocalyptic, but still quite grim. The story is told in the first person as a retrospective, with Austral describing how her daughter came to be. It's quite captivating and describes this warmer, harsher future in detail - from the return of the Mammoth to the mistakes of growing the wrong crops to appease the right people. It's clear that humanity has failed to learn from past mistakes. Capitalism is still prevelant, as is political corruption, persecution and prejudice. 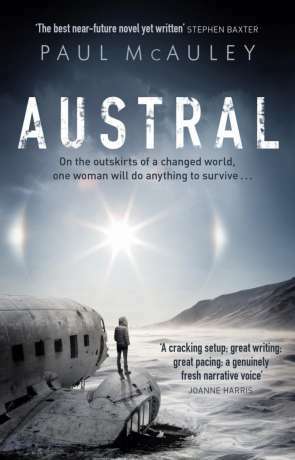 Despite this big, visionary view of a near-future earth, at it's heart the story of Austral is a personal one, following a revenge streaked path. This is inter-spaced with an interlude to a fairy tale that Austral's young companion is reading. Austral is clever, immersive and entertaining. It's a book that provides a bleak warning about the path we are curently following. It's not zombies or war or space rocks we need to worry about but the continued descent into capitalism and devolution of a social society that puts the care of our fragile planet second place to the greed of the corporation. Science fiction at it's finest. Written on 28th November 2017 by Ant.